The setup of networking hardware with cable modems and routers is much easier than it was before. However, it’s beneficial to understand what type of router is best for fast internet connection and avoiding unusual issues. Check out our guide below that shows the best cable modems on the market. Looking for a high-performance modem equipped with a wireless AC router? This one’s for you. The TP-Link AC1750 is a modem that supports a reliable home network. It even lets you stream 4K without slowing it down your home network. Now, this incredible modem is priced much higher than our runner-up. However, the difference in performance justifies that margin between price tags. Some customers who purchased the earlier version felt disappointed about the release of this new model just shortly after. There are a few complaints about drop in connectivity after using it for some time. One customer reported that didn’t seem to support his network well in a 1000sqft home. Provides up to 1750Mbps Wi-Fi speeds made possible by its 16 downstream and 4 upstream channels. A 2.4GHz processor supports heavy online gaming. Equipped with internal antennae and high-powered amplifiers, it can boost signal strength and reduce interference. Has a hassle-free setup. However, if you ever have any trouble with setting it up, their 24/7 support team is available and ready to assist. Looking at its price range counterparts, this one offers the best when it comes to internet speed and processor. Despite a few complaints, this device still rakes in more 4 and 5-star reviews. Additionally, it’s a 2-in-1 cable modem with great performance on upload and download speed at a reasonable price. 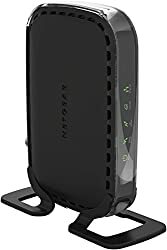 Because of all that it’s easily our best overall pick when it comes to the right cable modem for optimizing your internet connection. Another great choice when it comes to building your own network is the ARRIS SURFboard SB6141. It’s not a 2-in-1 cable modem, but that also means you get some flexibility over your router choice. Moreover, like our other top picks, this one also works on DOCSIS 3.0 with 8 downstream and 4 upstream channels. Though there's a perception that routers are complex, looking at the key specs and speed will get you through. The ARRIS SURFboard SB6141 is an easy pick over others because it has the best balance when it comes to that. Its LED lights are very bright and tend to bother some users. Our top pick won over our runner-up mainly on the 2-in-1 feature and speed. However, the ARRIS SURFboard SB6141 may be perfect for you if your internet use is more basic. At any rate, make the most of it by checking out options to set it up as a model/router combo. It’s posted for somewhere under a $100, but you can also find it in some places for under $50. For a modem that performs this well, for that price, and lasts that long, it easily gets our vote. This smart modem gives you speeds up to 680Mbps and its CM500-1AZNAS is ready to handle a wide variety of connection packages. Now, if you’re simply looking at raw functionality, just imagine simultaneously completing 16 downloads and 4 uploads. Considering its specs, you can do that with this modem without any trouble at all. Trying to find fault with this unit through customer feedback was a challenge because complaints are scarce and the raving reviews are plentiful. With this, you get great network speeds, a 16x4 channel bonding, and an easy set-up interface under $70. It’s hard to beat what this NETGEAR modem has to offer. Gigabit internet is the latest and top of the line. So to enjoy all that, though it means you’re willing to spend a little extra on your ISP subscription and modem. Consequently, if you’re looking to switch to fiber, you can check with your local provider if they have fiber optic lines that run to your home. However, it’s worth noting that internet speed maximum still depends on your subscription plan. Fastest internet speed with download speeds of up to 1.4Gbps for fiber and 626Mbps on cable, it’s a true gigabit modem. If you want to enjoy the full benefits of fiber internet, ARRIS SURFboard SB6183 is the perfect cable modem you'll find. Granted that it’s equipped with the best tech to help you optimize your gigabit subscription, but a major plus is that it comes with a price tag under $100. With 32x4 Channels and DOCSIS 3.0 to support channel bonding, you can’t go wrong with this modem. On a tight budget? We’ve got you covered. The D-Link DCM-301 is the most affordable cable modem for a great home networking solution. Specifically, it provides fair speed and a simple design that is easy to work into an individual networking setup. Plus, it’s simple enough to combine with your chosen cloud router or get it attached to a storage device for your network needs. So among all others on this range, this makes our best pick for a budget modem. Not likely to last until its 2-year warranty but still cheaper than renting a modem. Some inconsistency in connection, easily resolved with a quick reset. Easy to set-up, affordable, and with fair internet speeds, it’s easy for us to highly recommend the D-Link DCM-301. It’s perfect for small homes and apartments, doing the job fine. Compared to other routers at this price range (even some above it), this modem performs better. It’s great that it’s compatible with most Cable Providers, too. Since it can give you all that on a budget, it deserves its place in our top picks. If you live in a smaller space or want to keep the layout minimalistic you probably prefer a cable modem/router. Since there isn’t always a lot of room for cables and 2 separate devices, this makes a combo modem-router a good option. Some Xbox 1 players reported connection issues. A number of customers said they appreciate the speed but were not happy with its range. They’ve compared it to other modems like NETGEAR WNDR4500 and said this modem performed poorly when it came to range. Using a modem/router combo has its benefits, especially when it comes to keeping a clean, organized space. So, while the Motorola Smart MG7550 (with AC1900) may be a bit expensive, it offers the best speeds of the bunch. Despite the feedback about its range, it will still be ideal for a small apartment, home, or office. In addition, this one box network solution works great for gaming and streaming, and users definitely enjoy the speeds it supports. Because of all that, it’s earned its title for the best combo modem/router. Is it really worth it? Let’s see… Are you on the fastest internet plan doing a lot of HD video streams and 4K gaming? Well, yeah it’s worth it. It’s the fastest model that can support all those speeds and bandwidth-demanding internet activities. Speed demon, that’s what the NETGEAR Nighthawk AC1900 cable modem is. It justifies its price with reliable performance and the fastest internet offerings. You can decide to plugin to optimize what it offers or broadcast via Wi-Fi with the fastest Wi-Fi speeds. Moreover, more than a two-in-one unit, it’s actually three-in-one. It’s a DOCSIS 3.0 cable modem, an AC1900 Wi-Fi router, and a 4 gigabit wired switch. Still having second thoughts about the splurge? 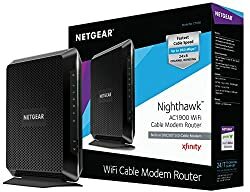 The NETGEAR Nighthawk with AC1900 comes highly recommended for those that signed-up for the highest internet tier from providers. This includes the Gigabit Pro plans. So, if you’re up for the best specs and have a good budget for it, this is the best buy out there. Looking at affordable modems in the less than $45 range, we don’t see much of a difference in specs or performance. The NETGEAR CM400-1AZNAS may be our runner-up choice but isn’t too far behind the TP-Link TC-7610-E when it comes to networking experience. The specs are almost the same, including the latest DOCSIS 3.0 standard. They both work with eight downstream channels and four upstream channels. Additionally, this modem easily provides 340 Mbps download speeds. It also comes with a gigabit Ethernet port so you can enjoy faster wired access. Added to that, users also appreciate this modem’s design since it allows you to have it in an upright position. This makes it perfect for when you’re short on space. Some users reported that the unit tends to heat up. A few users had problems achieving the speed promised on the first unit delivered. It’s cheap and it works. So, if you’re on a budget this modem would do just fine for your basic internet needs. Meanwhile, if you do encounter any problems, make sure to get in touch with support. While there may be complaints about the unit, it still rakes in a ton of good reviews. However, compared to other cheap units on the market, this unit is likely to give you problems. Cable vs. DSL: Which one to choose? Not sure which one works better? Let’s look at what makes these two services different. Cable connects you to the internet through existing television lines. With neighbors connected to the same cable company, you end up sharing the bandwidth for the same line. Though you share the bandwidth, this still tends to be a faster option compared to DSL. On the other hand, DSL uses phone lines. It’s not to be confused with the old Dial-up model but works in a similar way without the prompt for you to actually “dial-in”. This is because your DSL modem will do the actual dialing up for you automatically. Additionally, it offers speeds faster than the old dial-up connection. Now, DSL tends to be the pricier option. However, it tends to be more reliable when it comes to connectivity. So, depending on your location, habits, and perhaps your ISP’s footprint in your neighborhood, you can decide between the two. It’s good to assess which internet provider can give you the best performance and value for your money. Now, as you assess which one is best, also make sure to check which type of modem can support either of the two or both. If you want to know more which one to chose check out this article about the difference between DSL and Cable. We’ve looked at the TP-Link TC-7610-E as our best over-all. At the end of the day though, you are entitled to your choice depending on your need and preference. Additionally, it’s our pick for the best because it fits the most-used internet plans. However, you may need a little more power for more specific/demanding internet needs. For one, online gamers tend to have bigger needs when it comes to speed and connectivity. To help with that we’ve shown you the best modems to use with the fastest internet plans and those equipped with gigabit Ethernet ports. Now, tech will continue to evolve from here. There are DSL, cable, and now fiber optic options for your internet needs. So, which brand do you think will take the next lead on newer internet tech?